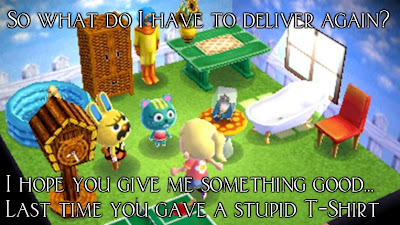 Animal Crossing is a difficult game to explain to people who haven’t already played it. It’s not strictly a simulation, like The Sims or SimCity, nor is it an RPG, like Final Fantasy. It has elements from both those genres, but somehow the Animal Crossing series has carved out its own unique place in the gaming landscape. 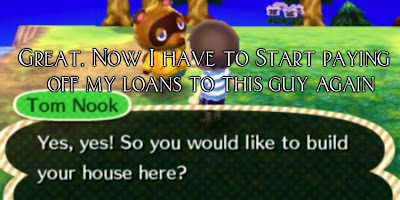 The newest addition to the franchise, Animal Crossing: New Leaf, continues the tradition of going into debt and paying off a raccoon while meeting and befriending animals and expanding your own home. If you are still tense from The Last of Us, Animal Crossing: New Leaf may be the game you need to relax your muscles and settle in for the night. As with previous iterations in the Animal Crossing series, you arrive in a new town to start a new life, except when you arrive in this town, everyone thinks you are the new mayor and can’t be persuaded otherwise. 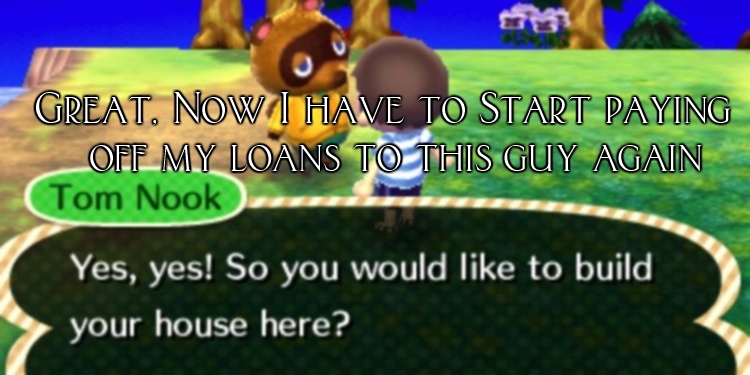 As this new career is dumped upon you, good old Tom Nook arrives to help you start your path into debt as he starts renovations on a brand new house. Not to worry though, you can sell almost anything you find around town to the stores to make a bell, the currency in New Leaf, or two. 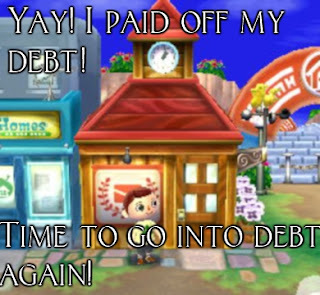 Being the mayor of your town is a pleasant change in perspective from previous Animal Crossing games. As mayor, I could enact policies that would change the town in various ways. Being up at night most of the time, I was able to enact the “Night Owl” ordinance, so that the shops would be open later and more people would be out at night. This kind of control is a real treat for fans of the Animal Crossing series, as it gives players the control they lacked in previous games, as well as provide a new avenue for changing the town to fit your schedule and preferences. Even though the process of selling off items to pay off loans is a simple mechanic, the game is still fun and quite pleasant to play. I rarely got bored or frustrated, and the characters were entertaining enough to keep me from putting down my 3DS. All of the other people living in your town are essentially NPCs, with pre-programmed responses and set personalities, yet it never felt that way. Each neighbor and friend in my town reacted differently whenever I spoke to them, and all of them change over time. As I did numerous errands for them, catching bugs, finding fruit, or fishing, their responses changed to whatever action I was doing. It is really enjoyable to play a game that values NPC interaction. Doing random favors for neighbors and playing games also nets you special items for your home. The more you expand your home, the more stuff you get to put in it, and delivering presents and playing Hide-and-Seek are easy ways to both interact with the town and get gifts for your home. Each day new items are found in the shops along your town’s main street, but the bulk of the items I received came from interacting with my towns inhabitants, or going to my friend’s town and talking with his neighbors. 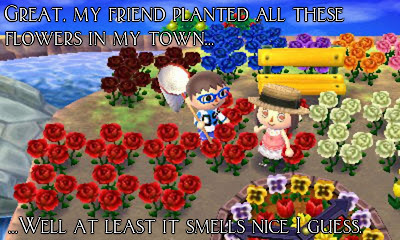 Being able to visit your friends in their towns is a great new addition to Animal Crossing’s gameplay. You can find fruit and other items unique to their town and see how your town compares. I enjoyed being able to talk to other townsfolk and peek in my friend’s house to see how their town has developed. While the game is largely a single player experience, it is great to be able to share your experience with others and not feel like your town is the only town in existence. One of the aspects of New Leaf that changes the most is the town’s main street. It’s where most of the stores are located and is the subject of a lot of change and renovation. New stores are created, older stores are upgraded, and plenty of classic characters, like KK Slider and the Able Sisters, can be found there. My town’s main street felt like a progression bar, covered in cute animals and functional stores. As I expanded my home, improved my city, and bought more items, different stores would move in and more people would show up and move in. It was a really clever way at displaying the result of my own actions. Animal Crossing: New Leaf, is very much the same game as its predecessors, but also is a better experience than previous iterations. Any fan of the previous games would fall back into their old addictions and enjoy New Leaf immensely. While you could buy an older game in the series and be a little more cost-efficient, New Leaf provides more variety, content, and fun than any of the other games. Animal Crossing: New Leaf is a pretty simple game; however that does not mean it is any less fun. Sometimes it is nice to sit back and relax with something pleasant and easy to play. Without any kind of drama, difficulty, or intensity, New Leaf keeps me coming back every day to find another fossil or buy another piece of furniture for my house. If you have played Animal Crossing before, or want to enjoy something uncomplicated and fluffy after getting eaten by zombie-like things in The Last of Us, pick this game up and spend hours talking to animals and catching bugs.